HONG KONG, Jan. 23, 2019 /PRNewswire/ — Catalyst, the award-winning manufacturer of protective waterproof cases, today announces the expansion of their Special Edition cases for AirPods launch to reach customers around the world. Three color variations of the AirPods cases were introduced throughout the United States and Canada in December and are now available at apple.com, select Apple Stores around the world and Catalystcase.com. 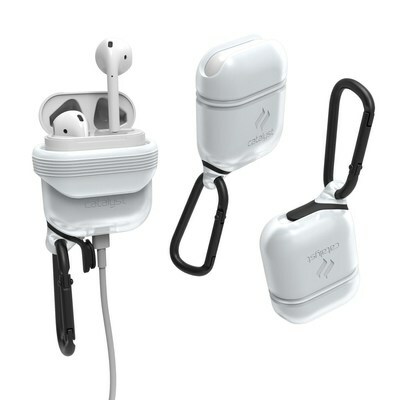 The AirPods case was created, developed and packaged with high quality and durable materials, providing AirPods waterproof protection to a high degree: The Special Edition Catalyst Case for AirPods offers an IP67 waterproof rating to 3.3ft (1m) and drop proof protection to 4ft (1.2m). At a retail price of $29.95 (USD), it’s an essential accessory. Offering waterproof protection for the AirPods charging case, the Special Edition Catalyst Case for AirPods is engineered with soft and durable silicone. Available in three exclusive colors, this patented waterproof case also features a premium lightweight carabiner in a matte finish. This carabiner is designed with an intuitive inward-facing clasp which makes it easier to hook onto belt loops, bags, and other belongings. As with the original Catalyst AirPods case, the case allows easy access to the charging port through the bottom seal and by folding back the top flap of the case, users can open the lid to access their AirPods for hands-free calls or mobile listening. Catalyst case for AirPods has been a top selling product since launch in April 2017, winning multiple awards and recognition as a unique protective case that is a stylish, essential everyday accessory. Users have reported that the AirPods case cover provides a high degree of protection against water and debris, protecting even against washing machine cycles. Catalyst is recognized globally for its constant innovation and unique designs, securing prestigious awards including the International Design Award in 2017, a CES Innovation Awards Honoree in 2018, and iPhone Life’s Best of CES2018.